Got Pests? 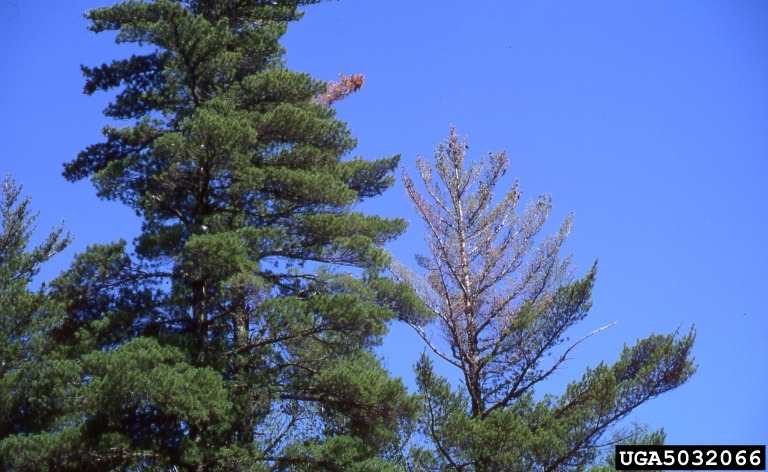 White Pine Blister Rust: GotPests? 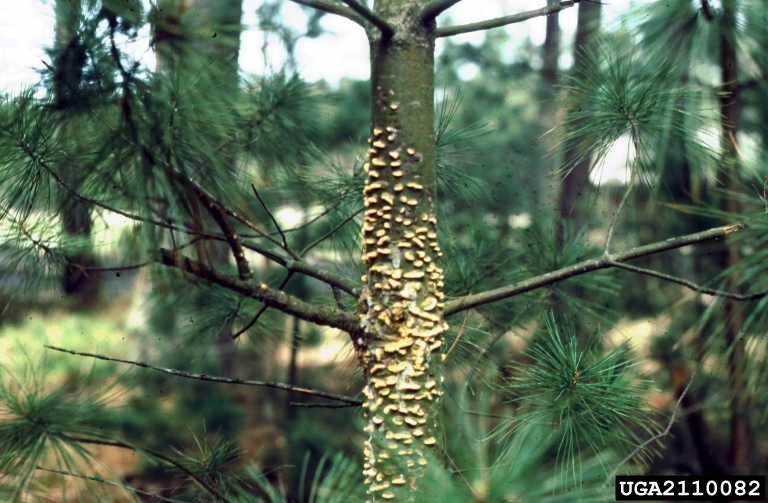 White pine blister rust, caused by the fungus Cronartium ribicola, was introduced into the U.S. around 1900 and has since spread throughout the range of white pine. 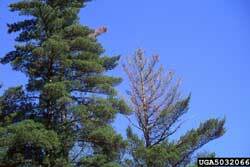 This disease causes mortality and severely reduces the commercial value of eastern white pine (Pinus strobus). 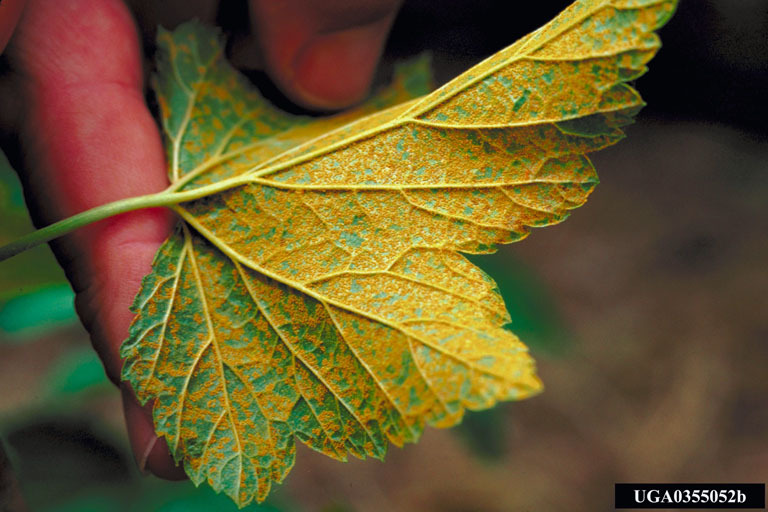 The rust fungus cannot spread from pine to pine but requires an alternate host, Ribes species, (currants and gooseberries, collectively called “ribes”), to complete the disease cycle. 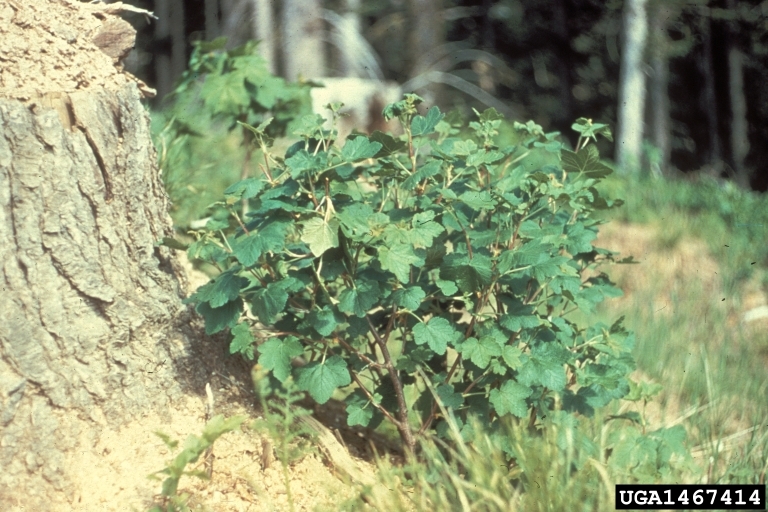 Planting or possession of European black currant, Ribes nigrum, or its varieties or hybrids anywhere within the boundaries of the State of Maine is prohibited. The sale, transportation, further planting or possession of plants of other species in the genus Ribes (commonly known as currants and gooseberries, including cultivated wild, or ornamental sorts) is prohibited in all of the following counties: York, Cumberland, Androscoggin, Kennebec, Sagadahoc, Lincoln, Knox, Waldo, Hancock, and parts of Oxford, Franklin, Somerset, Piscataquis, Penobscot, Aroostook, and Washington (quarantine map). This quarantine is administered by the Forest Health & Monitoring Division of the Maine Forest Service, phone: (207) 287-2431 or (207) 287-2791 (see below for links). 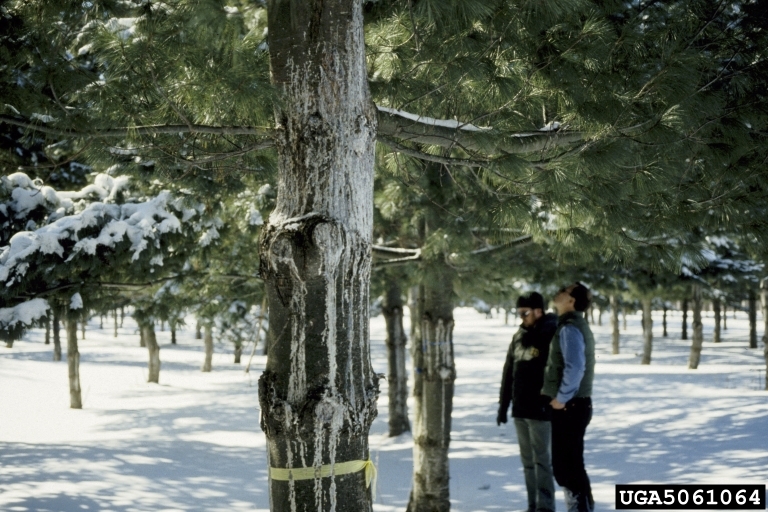 Die-back as a result of white pine blister rust. A blister rust canker showing the yellow-orange aecial state. Spores may be visible for up to 5 weeks. 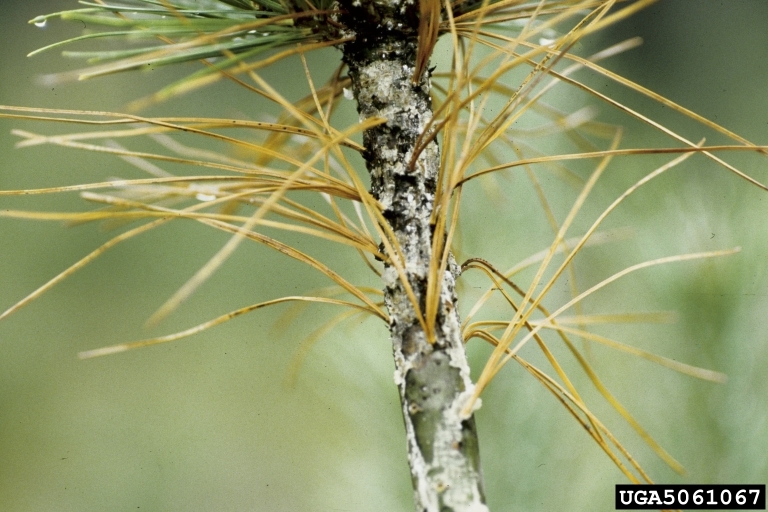 A blister rust canker on white pine. Note the presence of large quantities of dried resin around the canker. 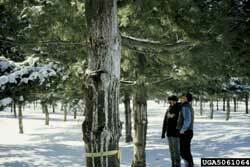 It may take a few years for the fungus to encircle the stem and kill the tree. 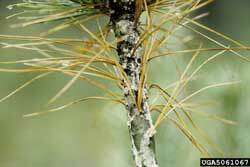 On branches with dying needles look for cankers and resin. 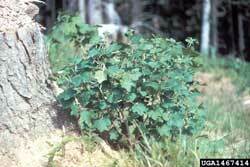 On Ribes, the symptoms develop throughout the growing season and are comparatively mild. 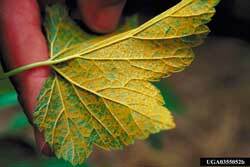 The lower leaf surface, when infected, becomes pale. 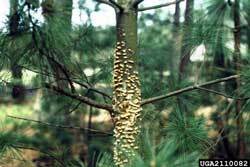 This is followed within a few days by the development of tiny orange pimple-like fruiting bodies (uredinia) in which yellow-orange rust spores are produced.